This property can only be rented through VRBO/HOMEAWAY. If you see a listing on Craig's List, it is from someone trying to scam you. Do not be scammed by fake listings on Craig's List. Property Address is: 109 20th Ave in Belmar. Spring Lake is an upscale, vacation community in southern Monmouth County featuring large sandy beaches and a boardwalk. House is on the last block in Belmar bordering Spring Lake, in a nice, quiet family area and close to all of the Summer attractions. The house is closer to the Spring Lake beach than many rentals in Spring Lake. Monmouth County is home of some of the best public golf courses in America. Just 20 minutes to 6 Flags Great Adventure. Walking distance to oceanfront restaurants and shops in Belmar. * HOUSE IS ONE SHORT BLOCK TO OCEAN!! * Brand new kitchen - stainless steel kitchenaid appliances, new cabinets, and granite counter tops. 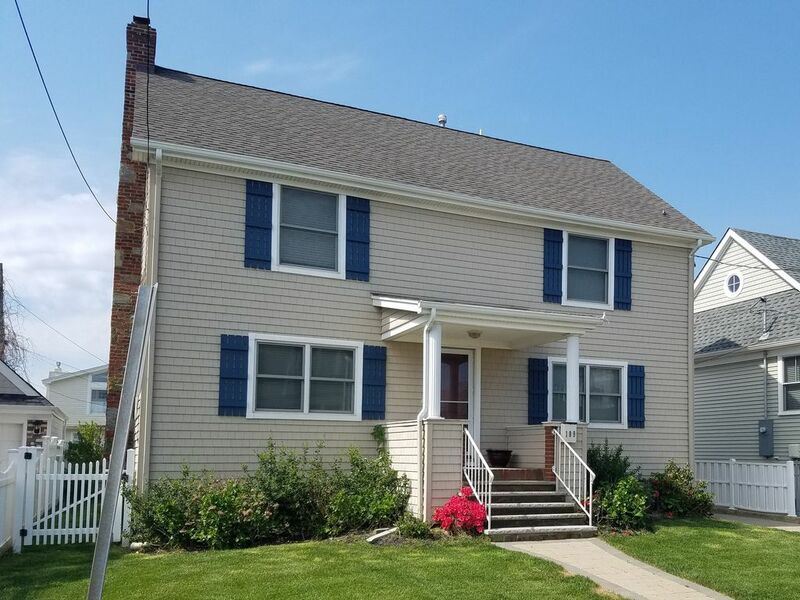 * Extremely nice and clean four bedroom colonial (one bedroom downstairs). * Two bedrooms freshly painted with Nautical Borders. * Two newly renovated bathrooms. * 24 feet X 14 feet master bedroom with ocean and lake views. * Beautiful lake views from every room and patio. * Living room 24 feet X 14 feet with fireplace. * Ocean and lake views from front porch. * Very quiet, family-oriented neighborhood with no group rentals. * Only six houses to the ocean. Walk to Belmar & Spring Lake Beaches. * Off street parking for at least three cars. * Great for families with small children. We will provide a high chair and two Pack and Play portable cribs if requested. * We also provide a two seater wagon and beach chairs for the beach. * We have a beach locker, so no need to carry chairs to the beach. * NO Groups, No Smoking, or Pets please. We will only rent to families or groups of families. It took us over two years to find a house to buy on this street. Houses rarely come on the market in this area, so we knew we had to have this house as soon as we walked through it. We love the location. It is located in a quiet family section of Belmar and incredibly close to the ocean. There is a nice view of the ocean from the porch and master bedroom. You also have a wonderful view of Lake Como. We loved the house and will carry wonderful memories from our time there! It was a perfect getaway in a lovely area of Belmar. Just walk up the street for a stroll on the boardwalk or to get to the beach. Many restaurants to choose from, near or a short drive away. We found the owner Heidi to be accommodating and helpful. She responded to all of our questions promptly. We really enjoyed being there and will be sure to recommend to others! For 8 summer vacations, this was our home away from home. The only reason we are not going back is that we got a dog and prefer to bring her with us on any two week stays. The proximity to the beach can't be beat and the neighborhood is quiet and family friendly. The accommodations were perfect for our family of 4 and one set of grandparents. When our boys were little, we appreciated the available safety gates, high chairs, toys, wagon, etc. The central air conditioning is also a great feature for those hot summer days. It's clean and has everything a family needs for a perfect beach vacation. We have many happy memories of our times at this house. We have rented this house for five years and found owners to be accomodating and respectful of any special needs. (we have 6 grandchildren) SIX houses to the beach!!! Despite destruction caused by Sandy, the owner fixed house for our annual 2nd week of July with a new kitchen, new flooring, updated family/livingroom furniture, appliances and new 2 zone a/c. The house is immaculate upon arrival and has all the amentiities you need (bedding etc). A new gas grill was installed in the backyard , along with a new dining set and the house offers great views of the ocean and the bay, especiially at sunset. Plus you have an outdoor shower ot supplememt the 2 full baths!! !The house includes 4 beach passes and lockers at the beach so you dont have to cart beach chairs , umbrellas etc every day. Dont have them, well, the locker contains enough chairs and umbrellas for a full family. Parking for 3 cars in a driveway is a great plus especially on weekends. Shopping and restaurants within walking distance.A remarkable rental , a great value in a great town!! You would pay more for less in the area. A very good value! !